You only want the best for your dog, especially when traveling. The Sky Kennel? 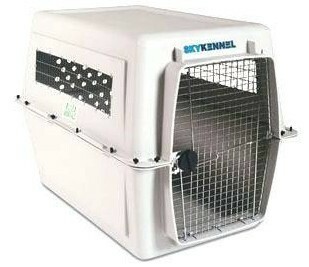 Dog Crate by PetMate? is preferred by airlines and is approved by the ATA (Airline Transportation Association). With heavy-duty construction 4-way ventillation and great visibility, , the Sky Kennel is the clear, comfortable choice when flying or driving with your pet. Also great for training! Note: Intermediate and larger kennels do not come with handles for carrying. Large, X-Large and Giant have a dial latch door system for added security.